Hello! 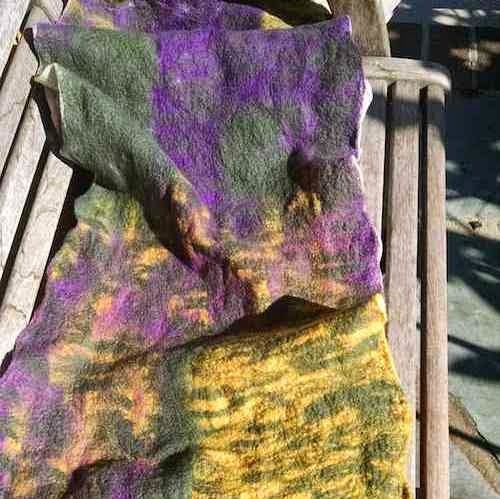 My name is Ava Chan, and I make and sell felted goods for home and body under the name Sugin Textiles. I became a member of Boston Handmade earlier this year and I’m thrilled to be here. A: I grew up in New York City in the South Bronx, during that neighborhood’s bad ol’ days in the 1960s and 70s. My family lived on the top floor of a five-story walkup and outside time was confined to the fire escape and the building’s tar roof. Now I live with two greyhounds in a little ranch house in Brighton that has a small lawn and a back yard. Instead of white picket, the fence enclosing my house is chain-link, but it’s still a world away from what I grew up with. I went up to Boston for college (I studied mechanical engineering at Boston University) and stayed. I’m intrigued by different work environments and how one earns a living. I’ve worked at general office jobs, as an ice cream scooper, a retail clerk, in a food coop, at a food pantry, as a software developer, as a technical writer, as an instructor of college freshman composition, and as a community organizer. Now I’m figuring out the components of owning a creative business. It is so delightful to be in the company of Boston Handmade members on this current adventure. A: I don’t remember the first things I made, but I do remember learning how to knit and crochet when I was about 7 or 8 years old – my mom taught me. I remember struggling with getting my rows to line up and to understand how you knew which way you were going when knitting up a row. I remember the thrill I felt when I figured it out. I still get that thrill now when I’m making something and get it to be what I want it to be. Q : What are your favorite materials? A: Generally speaking, natural fibers, wool first and foremost. Most feltmakers use merino fleece, which has a fine texture and felts readily. I really appreciate it after working with fleece from other breeds of sheep, such as Shetland, Icelandic, and Coopworth. I love the way that linen and hemp become softer with use. Silk is delightful. I also love clay, its malleability and how glazing and baking in a kiln seem to transform it into an entirely different substance. A: I really love the textures that can be developed with felt. I think like clay, wool has an alchemical nature. 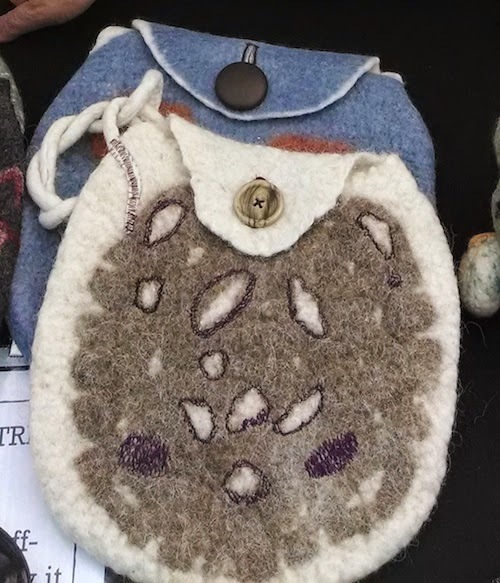 It can be made into 2D or 3D objects, and the texture of the finished object is influenced by the type of wool, how much is used, how it is laid out and how you stretch and rub it as you make the felt. Felt can be smooth, soft, hard, or coarse. You can increase the texture of a piece by incorporating various fibers or even pieces of cloth or other objects. Stitching on felt, whether by machine or hand, creates a quilted effect. You can even incorporate solid objects into felt. The more a piece moves away from a smooth surface, the more intriguing I find it. Q: What is your biggest obstacle with what you make? A: Feltmaking is slow! It takes a long time to get even merino fibers to mat together. I wish I worked faster. Q: What’s your favorite way to spend a Sunday morning? A: I love cooking on Sunday mornings: waffles, biscuits, fried rice or noodles, and then eating them. I share with the dogs.